Lighting for private, intimate spaces in your home like the bedroom or living room needs to be flattering as well as functional. Set the appropriate tone for reading, relaxing or conversing with an alluring selection of living room and bedroom lighting fixtures. 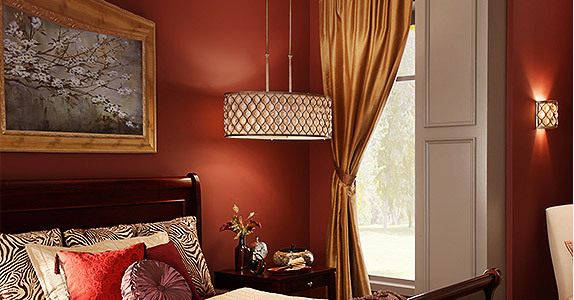 Add comfort and ambiance with fan and light combos. Statement fixtures to set the mood & style of a room. Bring some drama and style to your bedroom. Task and accent lighting to improve your bedside manner. Read or relax with cozy lighting that has decorative appeal. Easy attractive lighting that mounts flush or close to the ceiling. Use lighting to highlight a room’s unique focal points. Recessed lighting makes tight spaces like closets more functional. Install a dimmer with overhead fixtures to help reduce glare on the TV screen.